Joensuu, Finland – The International Society for Orthodox Church Music (ISOCM) is pleased to announce the publication of the second issue of its peer-reviewed online journal (JISOCM). 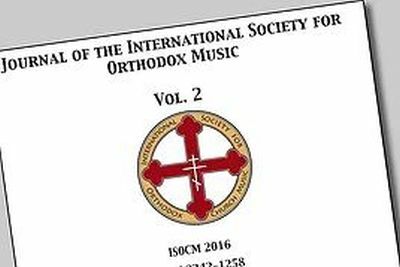 The second edition of the JISOCM features research papers about Orthodox church music in the wider Greek and Russian chant traditions, two articles dealing with important aspects of Orthodox church culture in Ukraine, and a selection of papers presented at the ISOCM’s 2016 symposium held in Minneapolis on 22-26 June, 2016. Individual articles and the complete volume 2 edition can be accessed in pdf format on-line at http://www.isocm.com/journal-vol02 while articles published in volume 1 can be accessed at http://www.isocm.com/journal-vol01. Submissions for the next issue are encouraged and will be published in 2017. Articles can be sent to the Secretary of the ISOCM, Dr Maria Takala-Roszczenko: isocm.secretary@gmail.com.